A few more holiday photos before getting back to business as usual. 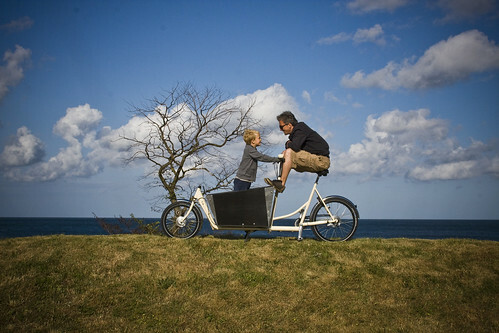 While visiting the island of Bornholm we were equipped with two new two-wheelers from Christiania Bikes [Thanks Annie & Lars!]. They were brilliant to ride and practical, too, with two kids, groceries, beach gear and what have you. Bornholm is a very hilly island with some nasty inclines but these bikes made easy work of the ups, as well as the downs. The kids loved them, too. There is a little bench inside the box which propped the kids up nice, but when Lulu dozed off on the longer routes, we could remove the bench and she could sleep as we rolled. I wish it was me. I took some photos for Christiania Bikes - above and below - for their brochure. Felix usually rode with me, along with the groceries if we visited the supermarket, while Lulu hung out in Wifealiciousness' bike. One day we visited a lovely amusement park - Joboland - for the day. Lulu's inevitable nap was an issue, so we put both kids in my box and placed her stroller folded up on Wifealiciousness' bike. The perfect solution. It was hot with temperatures pushing 30 degrees some days, so we used the canopy for Lulu, to keep the sun out of her eyes on the longer rides to the beach. She loved it. A cosy duvet to sit on, a fluffy pillow to lean against. A real princess ride. While on the topic of beaches, we have a post over at Copenhagenize.com about the insane amount of bicycles at Copenhagen beaches on hot summer days. Not to mention The Sushi Bike! Those bikes are hott. I like the canopy, how it stays up but let's in air. 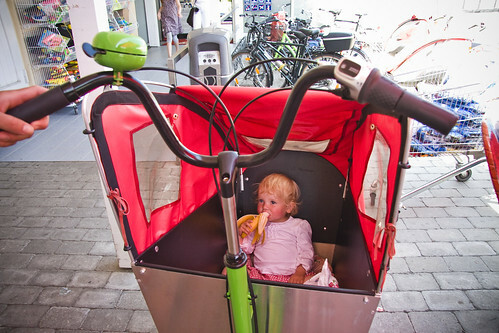 Love the idea of biking the stroller too. Thanks for all the great vacation shots and inspiration - most lovely. Wow, those are awesome! They look so much more useful than strapping a trailer to the back of a regular bike. Great shots and wonderful scenery. It looks like it was the perfect day. Thanks for taking us on such a lovely holiday! Really want one of these bikes. 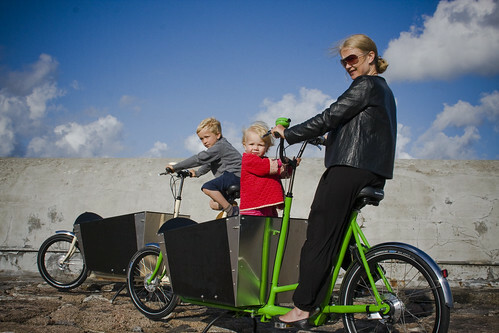 I love that the kids/cargo are the front of the cyclists. Seems safer to see the kids. Wish they would sell these kind of bikes in Southern California.